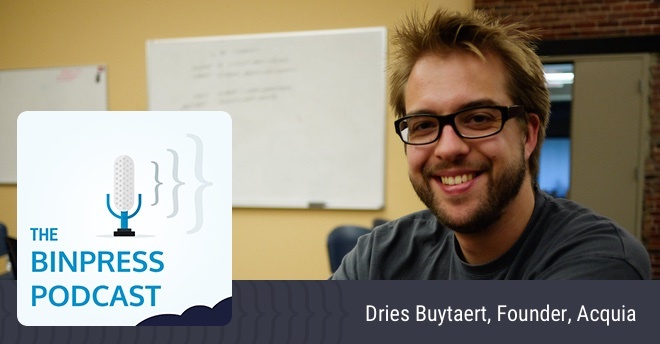 On this episode we talk with Dries Buytaert, founder of Acquia and creator of Drupal, the incredibly popular open source CMS. Dries covers how he got his start, Drupal’s origins, how Acquia found its footing, and why people skills are important for open source projects. He also discusses the beginning of an architectural shift for the web, how he manages burnout, and much more. Alexis: Dries, thank you for coming on the show! Alexis: So before we get to Acquia and Drupal, tell us a bit about your background. Dries: Sure. I was born and raised in Belgium. I got into computers pretty early on in life – I guess I was about eight years old or something when my dad came home with a Commodore 64 along with some programming books for kids, so I always tried to get on the computer. I wasn’t always allowed to be on the computer. Hey, mom. [Chuckling] I just grew up as a very nice youth, so to speak. And then when I finished high school, I went to study Computer Science at the University of Antwerp here in Belgium. I did that for four years, graduated with a Computer Science degree. I guess it’s sort of a Masters, although it wasn’t called a Masters at the time. It’s also at the University that I started the Drupal project. I can go back to that in a second if you like. Dries: Do you want me to keep going, sort of telling the history? Alexis: A quick interjection here. When you went to study Computer Science, what was the original game plan? “I’m going to get my degree and then I’m going to get a job in __.”? Dries: To be honest, I didn’t have a game plan in terms of what kind of job I would land, but other than, say, I would be a software engineer working in a technology startup, I never really felt attracted to working for large corporations. I always felt like the smaller startup-style environments would be better. So I guess my plan to the extent that I had a plan was to go and work at a technology startup on a software or R&D team. Alexis: Alright. How did that plan deviate? Dries: Well, it kind of worked out in the beginning, I must say. When I did finish college, I went to work at a startup called ACUNIA at the time; it was a company in Belgium. When I joined there was about 30 people, maybe a little bit less, but it was early on in this company, and I was part of an engineering team that was building embedded hardware and embedded software. The company itself built a telematics platform, so an in-car system for navigation software, but also downloading apps to your car. In many ways, it was 10-15 years ahead of its time, and I was part of the team that would port [clear 03:01] Linux to this embedded device, as well as built a Java Virtual Machine to run on this embedded Linux port. I was specifically focused on the Java Virtual Machine aspect, where I worked on garbage collection and just-in-time compilations. Kind of low-level software engineering, so to speak, and a little bit of hardware design as well. That was fun, and I did that for almost four years and saw the company grow to about 130 people, I would say, in over a course of three, four years, which at the time for me felt like amazing growth. It was a lot of fun. Not only was it challenging technically, but it was also a lot of fun in the sense that it’s really where I got the startup bug, if you will. There is a sense of purpose and a sense of camaraderie and working hard and having fun and people would often come in on Saturdays to keep working – it’s really passion there, and I really, really like that. Unfortunately, that came to an end shortly after the bubble burst. The company had to pivot into being more revenue-generating. It was sort of an R&D company working for a large automotive company like GM and stuff and so they all got back some of their R&D budgets and the company was pivoted. It was going to be more about fleet management – imagine you have all these trucks or cars and how do you know which cars are actually running or going somewhere versus being parked, and also giving them updated task lists in terms of deliveries on the fly versus having to leave in the morning with a printout of the things you have to do as a driver. We’d use our system to give them dynamic or updateable task lists. And so the company pivoted, and part of that pivot pretty much everybody in the company had to move from pure R&D into consulting or professional services so that everybody was revenue-generating. I wasn’t personally that excited about that shift, and so I went to visit one of my best friends at the University of Ghent – also in Belgium. I went there and they offered me a job, pretty much to become a PhD student. Dries: Yeah, and so I got a grant from the government, Belgian government, and I joined a PhD program. I did a PhD in Computer Science. Alexis: This is news to me. Clearly I didn’t do my research well enough. Dries: My PhD was all about Java performance – how we can make the Java Virtual Machine or the Java Runtime faster in terms of better algorithms for garbage collection, better algorithms for just-in-time compilations, and so I worked a lot on compilers, really. Alexis: Let me pause you here for a second. Taking a look at the levels – would you mind moving the microphone a bit closer just to – I don’t know if we’ll get –. Dries: I don’t know they can move it much. I can check my settings real quick – would that help? Alexis: Maybe. I think it would probably be alright in post, because with Skype, if you take the automatic levels box, it’ll make the background noise go up a lot higher, so we can leave it as is and it’ll be fine. Alexis: Alright, so you’re working on this Java Virtual Machine optimization. How did you eventually wind up doing web stuff? Dries: I actually started Drupal while I was at the University of Antwerp, so before I went to the University of Ghent for a PhD and before I started this job at the startup. I was still studying Computer Science in Antwerp at the time and one of my other best friends was actually living across the street from me in a dorm. For some reason, he was lucky enough to be one of the first 20 or 30 people in all of Antwerp, which is the second largest city in Belgium, to get a DSL – high-speed internet. Imagine working in my dorm across the street and I had a very slow dialup modem, and all of a sudden, one of my best friends across the street had internet that was – I didn’t even know, but let’s say, a hundred times faster. And so we did our research and we ended up finding this small company somewhere in the UK – I think it was in London – and the produced one of the first WLAN cards. Remember those things? You had to slide it in your computer. Alexis: Oh yeah, your 3/4th slot or something? Yeah. Dries: Yeah, exactly. They were brand new and they said, “We haven’t actually launched them yet” and so we got two of those. I don’t remember what we paid, but let’s say it was maybe a thousand dollars. They were still very expensive. This was early, early days. My friends were running Windows NT – for those that remember Windows NT – and they would literally ship new drivers every other day. Literally the bleeding edge version of their drivers. But I was using Linux at the time, so this was in ’98 or ’97 – I don’t know. I got involved with the Linux kernel and I contributed a little bit to the wireless network drivers for the Linux kernel and I ended up helping to maintain the documentation. That’s really when I first contributed to open source. I had been a user of open source for a number of years, but my desire to get on this fast Internet really helped me sort of contribute, because I had to make those drivers work. It was very flakey. We got it to work, but it was very flakey. I remember when I turned on my microwave in my dorm, the signal would drop. Or when a truck would drive through the street, the signal would drop. It wasn’t very reliable but we got it to work. I got on the Internet, and then at night we would literally drill holes in the floors to run cables to get other students on this network, and so they’re all using this fast Internet. We had this little community, if you will, in our dorm with just half a dozen people. It wasn’t much, but it was still fun. That message board was really the start of Drupal and I literally felt like, “I’m going to spend a couple of nights building this message board so we can leave each other messages about the status of the network.” These couple of nights turned into almost 15 years of work, to be honest. But that was honestly the start. I’d built websites before. I started building websites I believe around ’96 or something, and so I used to write them in Perl and CGI and Tcl/Tk and at the time, PHP was relatively new and MySQL, which is a database. I figured that instead of using these older languages, I’ll use the new kid on the block, and so I decided to build it in PHP and MySQL because they were so new. It was game-changing, to be honest, because we would save things in flat files instead of on databases. All of a sudden, we had a database and it was really cool. I got really excited about everything related to the web and started to very quickly evolve this message board into sort of an experimental platform. I experimented with RSS feeds, the dynamic web, which at the time was –. Dries: Yeah, exactly. All of these things. When I finished my studies, I decided to move out of my dorm; I decided to essentially take our intranet message board/experimental platform and moved it to the public Internet so we could stay in touch. Not everybody was moving out; it was just me or a couple of us. It was really fun; we had a small community, if you will, of people and so I ended up registering the main name for the website. I actually wanted to register dorp.org, which is D-O-R-P, which is Dutch for ‘small village’ or ‘community,’ because that’s what we had. But I remember making a typo and I ended up registering drop.org, so D-R-O-P; I switched the R and the O. And so I ended up going with this domain name and moved my message board to drop.org. I still own that domain; there’s no website on it anymore, but I kept working on my platform there. As I was doing things, for example in ’99 or 2000, my website worked very much like digg.com. I don’t know if you remember Digg, but –. Alexis: Yeah, it’s still around in some strange form. Dries: Right. At the time, it worked differently. Drop.org at the time, before Digg or Reddit or any of these things, basically everybody could submit stories and people could vote on those stories, and then the best stories would automatically go to the main page. There was this community-generated main page, if you will. So that was in there. And then blogging came along, but it wasn’t called blogging yet. It was called ‘public diaries.’ I built a module for Drupal – it wasn’t called Drupal, but for my site –. Dries: For drop.org, called Public Diaries. Even today, if you’d go and check out the first release of Drupal, which was again, the software behind this website, shipped with RSS feeds and a voting module and public diaries. In many ways, what I would do at the time is I would sort of observe emerging trends on the web and then just implement my system. What happened is that attracted an audience of people interested in the future of the web, because I would also write about these things, or blog about these things on my website itself. The purpose of my site changed from an intranet for half a dozen of people to sort of an experimental platform for myself that attracted people interested in the future of the web. People started to give suggestions as to “Here are some things you can implement” or they would help me fine-tune the algorithm that determined what would end up on the main page, for example. At some point, I said, “You know what? Instead of me having to do all the work, how about if I make the software behind my website available as open source so then you can use it as your own experimental platform. That’s really how Drupal was born. Just to finish that story, I had to come up with a name, obviously. Drop – the English word ‘drop’ in Dutch is ‘druppel’. Drupal is how I imagined an American or English-speaking person would pronounce the Dutch word drupel. To be honest, I literally spent 30 seconds thinking about the name, because I wasn’t expecting more than five people to actually download it and use it. It wasn’t a big deal for me, so I copied the GPL license file from my Linux kernel tree, which I had been contributing to a little bit – primarily documentation. I copied it into my website, I created a .zip file or a tar ball and I uploaded it in a blog post to drop.org and announced it as Drupal. This was on January 15, 2001. Alexis: Okay, so a couple of questions here. One, why didn’t you go with Drop? Was there some sort of copyright concerns there or trademark? Dries: That’s a good question. In many ways, it would have been the better name. For years, people would say, “Nobody will take your software seriously because the name is so – it’s a stupid name.” People don’t know how to pronounce it, especially in combination with our mascots, our logo at the time. I’m not sure if you’ve seen it, but it’s like a droplet and it looks like a cartoon character, maybe slightly evil. Not in a bad way, but people would say it’s a bad name, it has a bad logo and nobody, no organization would take it seriously because of these two things. Of course, fast forward, Drupal runs 1 out of 40 websites in the world. Alexis: The name doesn’t matter. Alexis: I’m curious about drop.org. Do you still have it tucked away, paying $12/year to have it registered, or did you pawn it off for $20,000 and got yourself a vacation in Cancun? Dries: No, I still own it. I pay whatever it is a year. Actually, as I’m talking and typing it in my browser to see – it doesn’t actually resolve. Dries: I hope it didn’t expire. I used domain name protection so you can’t even tell, but I assume I still have it. It says ‘Creation Date: 2000s’ so I imagine it’s – I don’t know, I’ll figure it out. Alexis: So if any listeners at home want to buy drop.org, you know who to call. Alexis: A question about the license, you said you just plucked up the license from Linux and popped it into the blog post. Was there a big personal connection with the GPL that you had, or did you just not really – “This would be good” – or did you have some sort of –. Dries: I was very passionate about Linux. I mean, I was very passionate about everything Linux and I would follow what was happening in the Linux community. At the time, there weren’t that many licenses, to be honest. I mean, it wasn’t like today where there are more variations of open source licenses or free software licenses. The GPL was definitely, at least in my understanding of the world at the time, was the way to go. That was what everybody was using, pretty much. With some exceptions, but it was the dominant license. I knew that license, understood that license, it’s what I’ve worked with, so to speak, and it was just a logical thing to do – to take that license. I wasn’t an expert on the different open source licenses at the time; I just had basic understanding of key differences of the top three licenses or something. Again, I never expected Drupal to take off, and I never expected more than a dozen people to use it or something. It wasn’t a big deal for me to pick the license and I literally just picked the one that I knew best. I didn’t give that too much thought or consideration. Alexis: What was the shift like from hobby to business and some of the growing pains you had to deal with? How did you solve them? Dries: Drupal was a hobby for seven years before I made my first dollar or euro with Drupal. I mean, as I went to work at this startup and as I went to do my PhD, I kept working on Drupal in my spare time – at night and on the weekends. That’s what I would work on. I kind of grew out of control towards the end, I must say, because there was a lot of work to do in my PhD, but then Drupal had grown to be a pretty healthy community as well. Large organizations like MTV or relatively large organizations like MTV, they switched to Drupal at the time. I was organizing Drupal conferences as well; I was organizing events, or helping to organize them. I mean, it was just a lot of work. The community had grown to be – it’s hard to say, but when we did events, the Drupal conferences, about 300 people would show up at the time. Or maybe a little bit more. I had already done a couple of things along the way. I started the Drupal Association – I think that was in 2005 – which was our nonprofit organization. It was all volunteer-driven at the time. Today, it’s about a six or seven million-dollar nonprofit with about 30 or 35 full-time employees. Now, they take care of the Drupal conferences and they take care of the Drupal website as well – Drupal.org – because that’s our home and the home of our community and where we collaborate and work together, and they maintain that. I’m the President of the Drupal Association, so I’m still involved, but not in a day-to-day operational role. That was in 2005. By the summer of 2007, I started Acquia together with a co-founder called Jay Batson and our mission, our vision, was to be to Drupal what Red Hat was to Linux and effectively provide commercial-grade support for large organizations that wanted to use Drupal and that needed some help. That was in 2007. That’s when I started effectively making money with Drupal. Meanwhile, it started as my intranet message board in 1999 or 2000 and then released a first version in 2001, and then it wasn’t until the summer of 2007 that I had a company. We didn’t actually sell anything in the first year. I had a salary, but – so that’s when I started to –. Alexis: So why didn’t you sell anything in the first year? Was that just being busy with everything else, or you were still trying to hammer out exactly what services you were going to offer? Dries: We made a business plan, Jay and I, and our vision was to build a technology company and not a professional services company, do consulting. We didn’t want to build websites; we wanted to provide products that others can use to make it easier to build websites. We made a business plan and we put a PowerPoint presentation together and we used that to go and raise money. We raised $7 million by December 2007 – four or five months before we started. We used that money to hire a team and to start building our product. We didn’t have a prototype; we didn’t have any of that kind of stuff – just an idea and a PowerPoint presentation, coupled with a business plan. Once we had the money, then we started building our products. It wasn’t until we launched our product that we could start charging money. It took us – I’m trying to remember exactly, but I think it took us about nine months to go from nothing to having hired a small team and build the first version of our product. Alexis: Okay. So when it comes to Acquia proper, what were some of the growing pains that you faced there? Dries: There’s always a lot of growing pains [chuckles] but I think for me, the biggest growing pains were – I’m trying to figure out which one to tell. One of them, for example – there are so many, but one of them, just to continue the story, was when we built our first product, we literally expected people to climb over the walls to buy it. We launched and nothing happened – crickets. Nothing. And so it took us three months to sell our first subscription after we launched the product. That was definitely a growing pain. We also learned that at least part of what we had built was wrong. We immediately had to throw out part of our vision. Our vision at the time was to rebuild a version of Drupal, which is the base version – Drupal Core – and then we would add a number of the most popular contributed modules, plugins that people built. We put that all together in one package that we called Acquia Drupal. Our version of Drupal was 100% open source and we said, “We’re going to support that version of Drupal.” Everything you do with that version of Drupal, we will guarantee that it scales, that it’s secure and all of these things. But we quickly found out that people needed much more creative freedom, that there was no such thing as one version of Drupal; they wanted to build custom modules and custom themes for look and feel and do custom integrate – every website is custom, obviously. We quickly had to give up on this notion of there being Acquia Drupal, and we said, “Alright, then we have to support everything Drupal – everything.” Thousands of modules and every line of custom code. For us, that was a big moment in terms of “how are we going to do that?” because it’s so vast. But we decided to do it and we did it. Alexis: And it worked it out. Alexis: The issue with your first product wasn’t just – it was mainly because it wasn’t fitting the need, right? Dries: Yeah, it didn’t. It was still limited, and so people wanted much more. Alexis: But I also wonder about marketing, especially with the second round of products. How did that fit into the whole vision? Because again, I imagine there’s a good amount of “Hey, yeah, we’re essentially the people who made Drupal. Folks are going to listen and we’re not going to need much marketing.” What kind of marketing did you need? How did you spread the word? Dries: First of all, Drupal is made by many people. Marketing – we did hire a marketing person out of the get-go. What we would do is we would primarily focus our marketing efforts at the existing Drupal community and so we would go to all the Drupal camps – these are events – and Drupal conferences and sponsor them and have a booth there or a table, speak at events. That’s initially what we did. It was a lot of sponsoring of events and providing thought leadership within the existing Drupal community. Alexis: Now I wonder when you announced that you were going to have Acquia Drupal, was there any discontent in the community? Alexis: Benevolent Dictator For Life, yeah. Dries: Yeah, and I’m still the project lead today, but imagine one day, everybody in the community wakes up and there’s this blog post that says “I’m starting my company and I’ve raised $7 million.” People were like, “Holy smokes! What does that mean?” Some people were concerned about would I be able to make decisions in the best interests of Drupal, or would my decisions now be biased in favor of Acquia? Alexis: I asked that to ask how you handled discontent in the community, whether in that instance or in the future. Dries: It was hard because there’s not much – I would try and reply to concerns with blog posts and comments, but at the end of the day, you have to show them. And so we show them. We literally said, “Here’s what we’re going to do” and then we did that. We’re going to continue to do all of these things and in fact, we’re going to make things better. And so we showed them over and over again, every day, for years, that our success was aligned with Drupal success and that we thought Drupal first then Acquia second. Frankly, we realized as a company – and still today – we know that our success is tied to Drupal success. We will not be successful as a company unless Drupal is successful, because we’re making money with Drupal. I think over the many years, people really started to see that, and Acquia found a place in the Drupal community, where people understood that Acquia is maybe a little special, in a way, compared to other companies in the ecosystem, but I think there is a bit of a symbiotic relationship as well. Acquia needs Drupal, but at the same time, I think everybody or almost everybody in the Drupal community will also recognize that Acquia’s really contributed to Drupal and that without some of our efforts in engineering and also in marketing, and getting large organizations to adopt Drupal, without some of these efforts, Drupal wouldn’t be where it is today. So I think we’re recognized as a contributor and as sort of a good thing for Drupal. Alexis: Yeah, in a way, the company became a community member. Alexis: So after spending more than a decade in the open source world, what are some tips or things that open source projects can do to become sustainable? That doesn’t necessarily mean profitable, but just sustainable in general. Dries: This is a very complex topic, and I’ve actually written about this and talked about this a lot. It depends on what stage you’re at, I would say. As communities get bigger and bigger, it becomes more complex to sustain it. It’s a little bit like many other things. Let’s say, the road system – other things in life. Roads initially were created because people needed to go from A to B. At some points, commercial interests got involved and people realized, “If we have roads, good roads, we can actually ship or transport our goods faster” and so commercial organizations started to invest in making roads better. A lot of these roads were actually commercial roads where people had to pay toll. And then at some point, these roads, they’ve obviously benefited the businesses that wanted to transport goods, but it also benefited individuals that wanted to ride their cars or bikes or horses, so it’s a win-win situation. But at some point, you’ll end up with a system where everybody depends on roads being available, that you kind of have to institutionalize how roads are maintained, and so governments take over the maintenance of the roads. There’s this evolution of things in our world that are born out of volunteer efforts that are then driven partially, sometimes even primarily, by commercial interests, and eventually becomes so big, governments need to step up and help take over the maintenance. Roads are an example, but the military is another example, which was started by volunteers because they wanted to defend their towns, or basic security. Education is another example of something that evolved from volunteer-driven projects, if you will. Something that is now institutionalized on a national level and where governments have a lot of impact on. Alexis: Now kind of repackaging that question in a different way, what’s one thing that you see a lot of open source projects doing or not doing that you’re just like, “Man, I wish they would change this about the way they’re doing things. Life would be so much better for them”? Dries: I don’t know – that’s a tough one. I’m trying to think what the one thing would be, but I think the reason Drupal is successful is because of all the people that are involved. We have a lot of amazing contributors and leaders in our community, and so I think the thing to do is to create an environment where everybody can be a leader in addition to being a contributor and where people can step up and take ownership of things, whether it’s a piece of documentation or a component of the software or translations of it. You want to encourage people to get involved and to take a leadership role, and that requires the right culture, and that requires the right governments as well. In my case, in the early days of Drupal, it was almost the lack of governments – and I mean that in a good way. In a sense, I try to not get in the way of the community, so to speak, and so sometimes I see people have too many roles, and other times I see project leads that sort of get in the way of their community, kind of holding their community back. I think a lot of things are people-related. The soft skills are really important to foster community and collaboration and the right culture. Alexis: I’m curious about competition – loosely defined for the open source world. How do you handle it when you see – again, this could be in the early days, or now, or how you’re proceeding in the future. “Oh man, X framework has appeared and people are really excited about it” or “This other framework is following this path of development and a lot of the community really wants to see this kind of thing in Drupal but we got to stick to our guns and go this certain way” or that kind of thing. Dries: I’m not sure if there’s a good formula for this, but I’ve always seen it as my job to try and set the direction in rough brush strokes, of where we need to go. On top of that, enable the community to add other things to our roadmap, so to speak. We always have this interesting mix between “Here’s where we should go based on where I thought the future will be” combined with more unexpected things that people would bring to the table. That model has actually served us really well. I feel like Drupal has always been at the right time with the right features, and it’s one of the reasons why we’ve grown so fast. But at the end of the day, we’ve never been too focused on competition either. We look at trends that are happening and we try to make sure that we are moving in the right direction, but we’re not really obsessive about what other projects our proprietary competitors are doing. We pay some attention, but I don’t think anyone gets worked up by them. Alexis: Alright. When it comes to Acquia, what have you learned about pricing? Have you had to change pricing a lot? Dries: Just to give you a little bit of background on Acquia, we started with this idea of being the Red Hat of Drupal, but we also quickly realized that we had a bigger opportunity, that we could offer more. And so we ended up building something called Acquia Cloud, which is a Platform as a Service environment where people can build websites and then we host them and it can scale them as well. There’s a lot of bells and whistles there from testing environments to low testing tools, to security scanners – it’s a very rich platform that we’ve built in the cloud. We still have support, and then we have other products which we call Engagement Services. One of them is called Acquia Lift, and it’s a Software as a Service. What it’s used for is for personalizing or contextualizing websites. It learns about visitors on your Drupal site and then it will serve them content which is more relevant to them. If it’s a newspaper website and you love politics, your Drupal site can serve you more politics-related articles, but if you love sports, then the main page could kind of be more about sports and less about politics. I’m simplifying it a lot. The reason I’m telling you this is because today, Acquia has half a dozen of different products and we bundle those in the Acquia platform, but each of them have pricing, to be honest. Some of it is Software as a Service, some of it is Platform as a Service, and so we have different pricing models everywhere and we’ve evolved them all based on what we’ve learned but also in terms of if we add features to the products and it becomes more rich. That also usually adds different ways of pricing to software. Our pricing, because we’re so focused on the enterprise, we’re focused on the biggest websites and the most complex websites, and because our customers need a combination or all of our tools, pricing is really complex. It’s not like normal consumer-level pricing. Alexis: Right, like I’m going to make my app $40 and see how it goes. Dries: Our biggest customers are multi-million dollar deals, and our smallest customers are maybe a couple hundred dollars a month. We have really covered the whole spectrum, and as a result, our pricing models are pretty complex because they have to be so scalable in terms of size and complexity, but also in terms of how many products are bundled in, so to speak. Alexis: Pulling in from earlier when you mentioned at the automotive startup that there was all this excitement in the early days, and then as things changed later on, there was less excitement. Has that changed over time with yourself and Acquia and the Drupal project? And bundled with that, how do you manage burnout? Dries: That’s a good question. I’m still very excited about what I do. I’ve always told myself, if I’m doing something which I don’t enjoy doing, I would stop. I don’t want to spend my life or part of my life doing things which I don’t really enjoy, so I enjoy what I do. I will say that the advantage that I have is that my role has changed so much from being the only developer of Drupal and running everything from our infrastructure to the roadmap – doing everything – to now, there’s thousands of people that are involved and my role has changed to be more of a people manager. In fact, I manage people that manage people, and it’s more strategic as well. I still look at codes, and on the Acquia side – Acquia has grown. We’re over 600 people now. In just seven years we’ve grown very fast. Even there, my role has changed a lot. What’s great about my job is the combination of Drupal and Acquia and within each of those two roles, there’s a lot of variety. I’m surrounded by great teams of people on both sides, really, and I think that just makes it a lot of fun and gives me a lot of variety, which is key to fighting burnouts and getting bored. Alexis: Now you’ve mentioned the people skills or the soft skills a couple of times. I’m curious what you consider the most important ones, or what lessons you’ve learned that might apply to whether open source projects or commercial projects? Because I mentioned those skills are even more transferable than other kinds of lessons. Dries: That’s a tough one. I think the ability to listen to people – generally, listen to what they have to say and then taking their feedback and acting upon that – and willingness to be wrong and the desire to collaborate with people are essential skills for anyone in an open source project to really do well. It’s kind of hard to talk about these things, to be honest. Alexis: Especially when it’s not so specific, right? Dries: Yeah. I don’t usually sit down and think about some of these questions, I guess. I’ve grown into them, and now it’s just a way of working. Being nice to people and listening and working with them I think are key. Alexis: How do you keep yourself organized, especially with so many moving parts, at a 600-person organization? Dries: That comes down to having the right organizational structure in place and delegating the things that you want to delegate and making sure you have the right people there that can take ownership of things – that’s one part. A lot of my struggles have been around learning how to scale myself, both in Drupal and in Acquia. It’s like literally learning to let go and to delegate, so that’s one thing that everybody has to learn that’s part of a growing organization. Secondly, I do have an admin as well. I have people that help me stay organized and to help me keep track of all the things which are happening in my world, and to help make sure nothing slips through the cracks. That’s another way to do it – you can get help [chuckles]. I admit that I’m not the world’s most organized person. Alexis: Let’s see – sorry, flipping through my question list here. On your blog, you wrote an article about the big reverse. Could you summarize that for folks who haven’t read it? Dries: Sure. This belief that we’re in the early phases of a big architectural change on the web, where the web is going from what I’ve described as pull to a push-based model. What I mean by that is today, let’s say you want to buy a shirt for somebody. Usually what you do is you go to multiple websites. You have to visit these websites to looks for a nice shirt, and then you may want to do price comparison or read previews. Once you find the shirt you would like to buy, you would have to sign up on the website, you have to enter your personal information, your credit card information, your shipping address. If you think about the whole process of buying a shirt and having to visit all these websites and then having to provide all of that information, there’s just a lot of friction, to be honest. It’s complex; it can easily take an hour or two hours, or even more. There are people that spend the whole night buying one thing. This belief that we can make that a lot better by flipping the model, and I think what we’ll see in the future is push-based systems that know your budgets for shirts, that know your size, that know your style, and what effectively they’ll do is they’ll push shirts to you. Instead of having to go to all of these websites, we’ll be able to discover relevant products or content because they’re pushed to you. There’s actually early examples of that today, and they’re pretty big examples. If you think about news and media, today, when you want to read the news, often people go to a website. You visit a website or multiple websites; you go from the New York Times to Reddit to other things, and so that’s very pull-based. The push model is actually Flipboard – if you’re familiar with Flipboard. Flipboard aggregates articles from thousands of different websites. You tell Flipboard what you’re interested in, whether it’s tennis or computers or Drupal or whatever it is – you tell it what you’re interested in, and Flipboard will then push you content that it believes you like, based on these interests and then you can give feedback as well. It’s a great example of how we went from a pull-based model to a push-based model for news. Another example is actually how you stay in touch with people. Facebook, to be honest, made that a push model. Instead of having to call parents on the weekends and say, “Hey, how are things going?” or “How’s the rest of the family?” or having to call your friends, which is pull, Facebook makes it a push model because people answer their statuses and they’re pushed to you. It really made it much less time-consuming and much easier to stay in touch with your family and all of your friends and it enabled people to stay in touch often with hundreds of different people at the same time. Again, it’s an example of how switching to push eliminates a lot of friction and just makes experience better. Another quick example is, broadcast radio was pull – you had to tune to the right station to find the music you like. Pandora and Spotify made that push, and they send you personalized music – things you like – and they can get feedback. Pinterest is doing a push model for products that you may want to buy. There’s a longer list here as well. My blog post writes about this and says we’re actually in the early days of this model, and I feel like the rest of the Internet, if you will, may evolve from a pull to a push model as well. I gave an example in the blog post about commerce, how instead of having to go to a mall and visit all these different stores, or instead of having to visit multiple websites, it’s not too hard to imagine that on your cellphone or on your computer, you can have sort of a personalized fashion stream, or products, clothing from thousands of different brands can be presented to you and filtered based on budget, likings, price, size, events you want to buy clothing for, what have you. Alexis: Right. If I may get on my speculative soapbox for a moment here, my one concern with this is that this will lead to more gatekeepers and potentially fewer sources, in a way. Dries: I think it’s very transformative and it’s definitely a little scary as well, because there’s privacy concerns with this model, because it all depends on knowing personal information, interests, or context about the user. But it’s also, to your point, it also risks the open web closing, if you will, because it’s the Amazons, the Googles, the Facebooks, the Twitters – these large platforms that are in the right position to build these push-based experiences because they have large data centers. They have access to a lot of users; they know things about you. I mean, the amount of stuff Facebook knows about you or Google knows about you – that makes them prime candidates. The fact that they have so much information, the fact that they know so much about you, the fact that they actually often control – like Google, they have phones and tablets and computers; they have the whole stack. They can build these optimal experiences, and it’s very hard for others to build these experiences without large data centers, a lot of personal information about users, and no control over the device. A lot about these push experiences, like notifications for example – it really helps if you can send notifications to people. Alexis: And one last question here, because I know we’ve got to hard stop. What is one mistake you’d rather not repeat? Dries: Wow, let’s see. It’s hard to say. At the end of the day, as I mentioned, I’m a big believer in teams, and I think success is a result of having a great team. Sometimes, the biggest mistakes I’ve made are team-related. Maybe I’ve hired the wrong person or I didn’t deal with it fast enough – I don’t know. I’ve learned a lot about managing teams and I think that’s where mistakes can be avoided. Alexis: Alright. So Dries, where can people find you on the Web? Dries: I have my own blog, which you’re welcome to visit and subscribe to it as well, either using RSS or email. My blog is buytaert.net – it’s my last name (dot) net, so B-U-Y-T-A-E-R-T (dot) net. You can find me on Twitter, on @Dries – D-R-I-E-S. I’m on Facebook as well. I’m on LinkedIn as well, if you’d like to connect with me on LinkedIn, but these are the main channels that I use. Alexis: Alright, and for ourselves you can find us at @Binpress and myself, @alexissantos. Dries, I still have about 40 questions for you, so I guess I’ll have to wait for another time [chuckles]. Dries: Yeah, would love to do it again. Alexis: Thanks again for coming on the show. Dries: You’re welcome! Thanks for having me.